Cranfield University Blogs | Alumni Library Online: What’s in it for me? Did you know that as an alumnus you can still have access to some of the resources you have been using at Cranfield? And, even better, did you know that the service is free? You can also benefit from our collection of links to high-quality subject-specific websites selected by our information specialists. This includes a number of sources for full-text journals and theses. So where do I login? 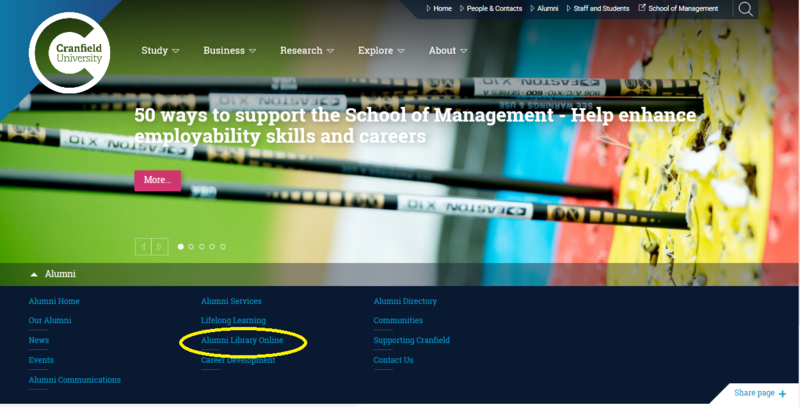 You can find ‘Alumni Library Online’ under the main list of links when you log in to the alumni portal. How do I search a specific database effectively? Can I access my favourite journal? How can I keep up to date in my subject area? How can I keep up with Cranfield research? How can I effectively organise my selected articles and references? It can really help you with job-hunting and preparing for interviews. Make sure you are battle-ready by doing some background reading on companies and industry trends. Please contact the Alumni Office for advice on your portal login: alumni@cranfield.ac.uk.